A quick and easy gift for children to make and give to grandparents is a calendar. I wanted our calendar to be appropriate for the whole year so decided to represent each season with a tree. 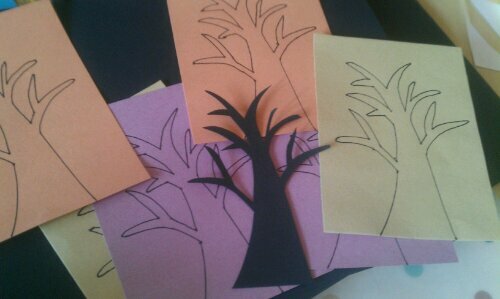 I cut out a simple tree shape which I used to draw around. 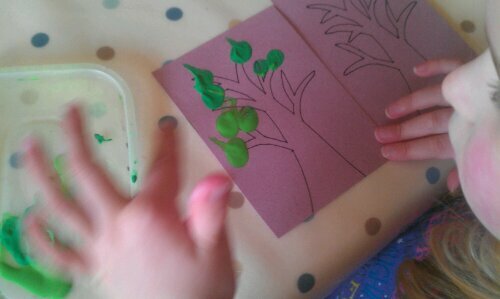 Once we had 4 trees drawn on appropriate coloured paper The Limpet got to work finger printing. 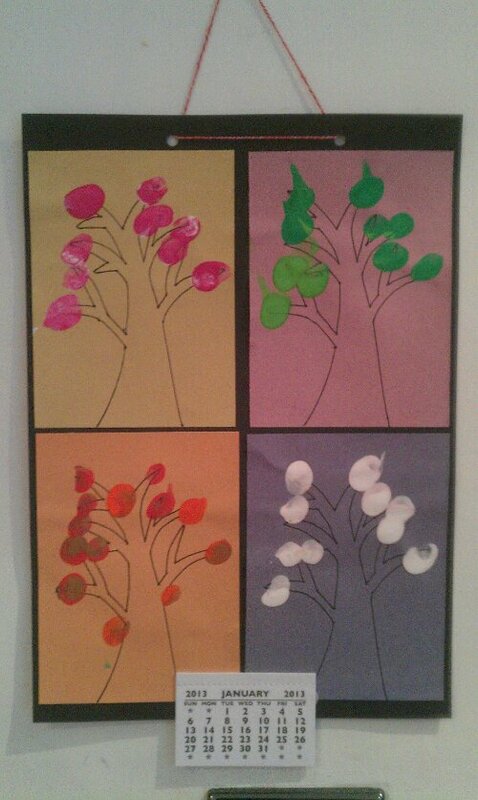 For spring we did pink blossom; summer was green leaves; autumn red, brown and orange leaves. And we finished with snow for winter. I added the calendar at the bottom and some coloured string to hang it up with. I think the grandparents will be very pleased. 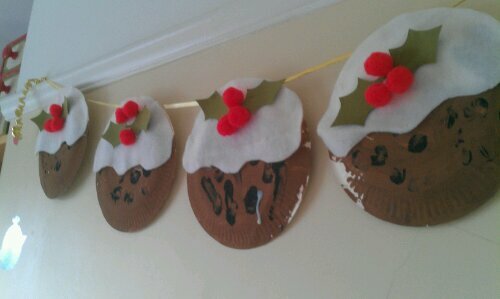 This cute little garland was made to add a bit of festive fun to The Limpet’s room. It is made with one of my favourite and most used craft item – paper plates. I got The Limpet to paint five plates blown and then add black finger painted spots. It took a while to dry so in the meantime I cut out 5 white icing shapes from some fabric and 10 holly leaves. Everything else about this craft was done by my 3 year old. When they were dry I punched holes in the top of each and threaded through a gold gift ribbon. Then The Limpet got to work sticking it all together. 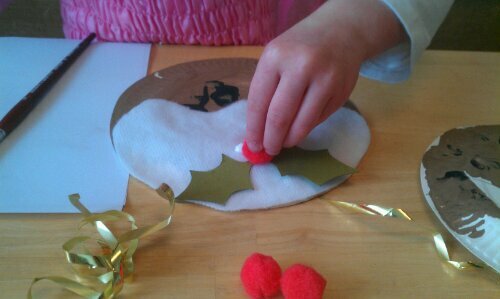 We used red pompoms for the holly berries and stuck them down with a blob of fabric glue. They certainly brighter up her room. 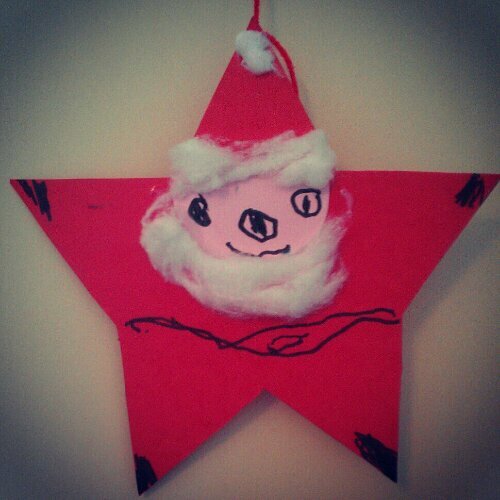 Our latest activity on the advent activity tree was to make a Father Christmas decoration. I had made something similar many years ago when I worked as a nursery nurse. I think that time round I had used a longer star and managed to fit in some buttons on his tummy. I had also cut out a belt which they stuck on. This time I let The Limpet draw most of the features as she has suddenly become very good at drawing. 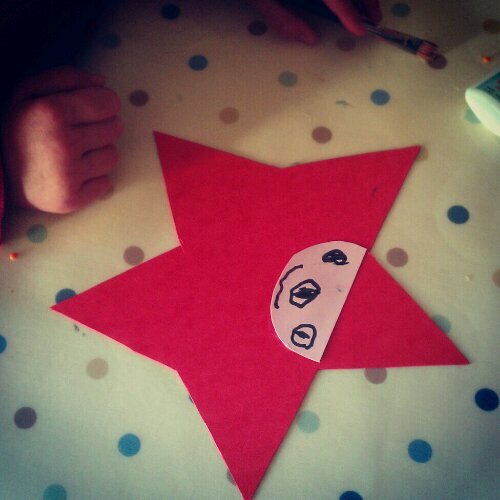 I cut out a large star from red card and a semi circle in pink for the face. Once she had drawn the face on and stuck it down she then added a cotton wool beard and some more for the hat. She then finished it off with black gloves, boots and a belt. 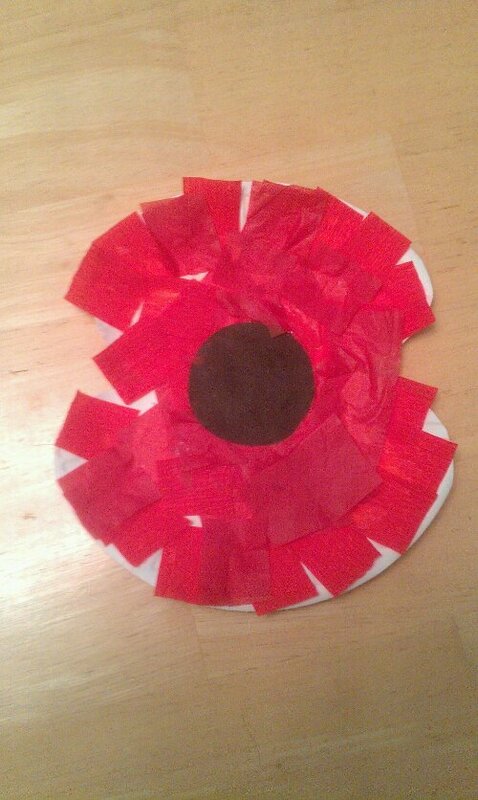 This week at our toddler group the craft activity was poppies for remembrance Sunday. Because we have about 60 children attending I have to keep it fairly simple. 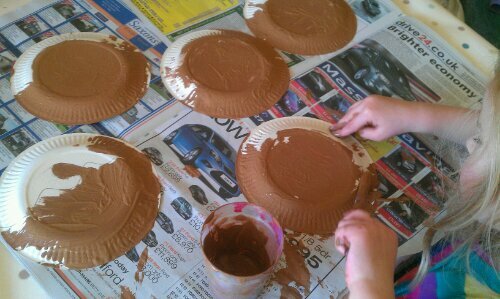 Most of my crafts so far seem to involve a paper plate. 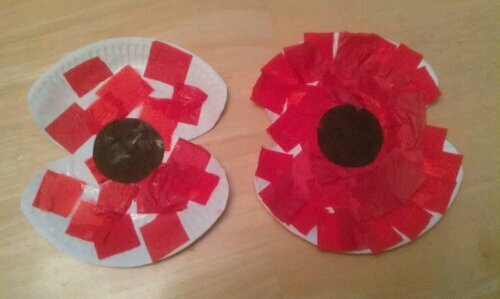 This time I cut 2 curvy triangles out of the sides of a paper plate to create a very simple poppy shape. 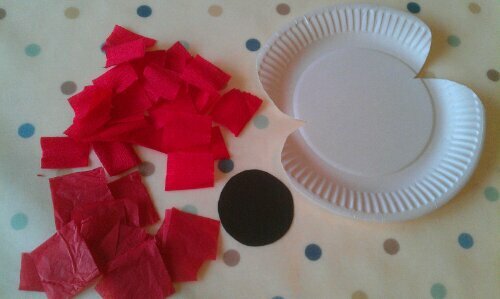 I provided cut up squares of red tissue paper and crate paper and a circle of black card for the centre. I set up this activity first for my own children. 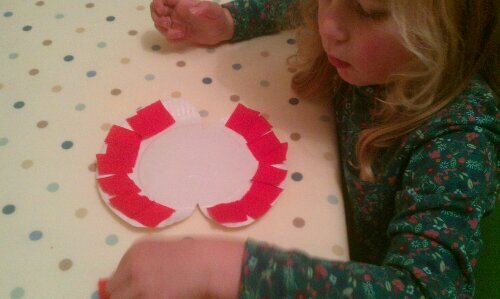 The Limpet placed her red squares in a very methodical way. I love seeing the differences in my kids creations, I think both turned out really well. Now that the clocks have changed we always have our tea after the sun has set. I find this time of year a little miserable, its the thought of the cold, dark winter ahead of us. So I decided we needed a bit more light in our lives. 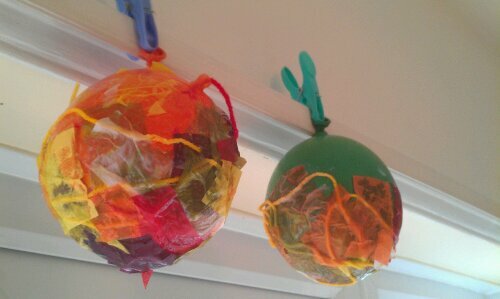 We created these lanterns with some balloons, PVA glue, tissue paper and wool. I’ve seen a few similar things on pinterest and thought they look very pretty. I blew up three balloons so they each had a small amount of air in them. We spread some Vaseline over the balloon first as I wasn’t sure how well the lantern would separate from the balloon at the end. We then covered the balloons in a watered down PVA glue mixture and covered with small squares of tissue paper. I deliberately picked autumnal colours. We kept adding more glue and more tissue paper and then decided to add some wool which we covered with a final layer of tissue paper then hung up to dry. 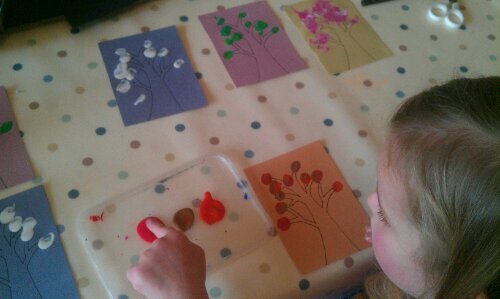 Both children got involved in this activity although I did have to finish the lanterns off when they got bored. When dry, I cut the top off the balloon and cut a neat circle around the top. The deflated balloon then pulled away easily from the lantern. 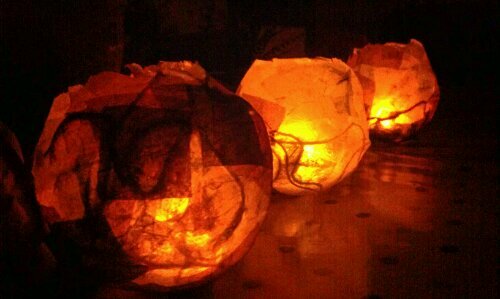 The lanterns did initially scrunch up a bit as the balloon shriveled but I gently pushed them back into shape. I put a battery operated tea light in each one as I felt it was safer then a naked flame. They made a great table decoration at our firework party and we now frequently have our tea with the lights off and lanterns lit. Bonfire night is just a few days away and this year we’ve decided to hold our own firework party. Hopefully the kids won’t be too scared by all the noise! I decided our house needed a little decorating for the party and rockets seemed to be the most obvious thing. These started life as a humble toilet roll. 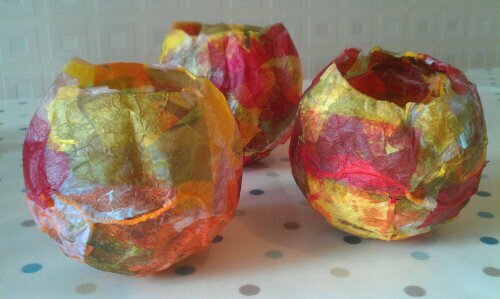 I wrapped them in coloured paper and made little paper cones for the top of each one. Then The Limpet got to work on the decoration. 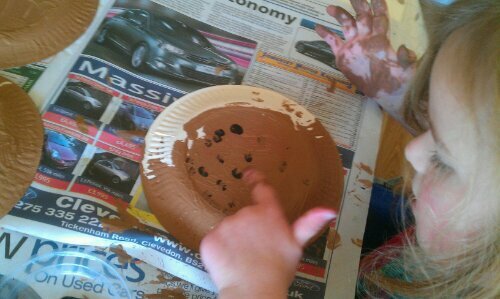 It involved A LOT of glue so I was a bit too sticky to use the camera to take photos of their creation. When they were dry I attached some ‘flames’ to the bottom and strung them up with invisible thread. My regular readers may have noticed my recent absence. Well, I haven’t actually been anywhere, I’ve just been busy with other things. One of the things that has been keeping me busy is my new role in charge of creative activities at our church toddler group. I’m really enjoying the responsibility but organising activities for children aged between 0 and 4 is quite a challenge. One of the first topics we did was the story of Noah’s Ark. For this activity we did a sunshine and rainbow. I tried it out initially with my own 1 and 3 year old and it went quite well although I had to help the 1 year old quite a lot. The idea came from this post which I found via pinterest. 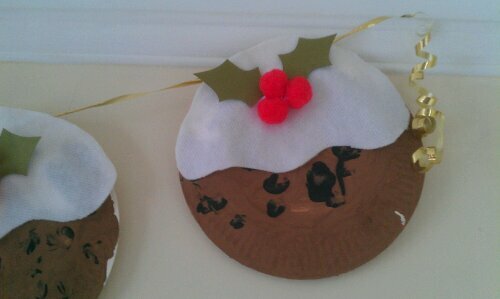 Here are a few of the ones made at toddlers. I had never heard of an eye spy bottle before seeing them on pinterest. At first I wasn’t too sure about how well they would work, the majority seemed to come with a list of items that needed to be found. This obviously wouldn’t work with pre-readers. Then I discovered this brilliant rainbow eye spy bottle on Pink and Green Mamas site. It looked so pretty and inviting that I decided to give it a go. After finding two tiny dolls shoes I had a sudden brainwave to put two of every item into the bottle. This way there’s no need to mess about with written or visual lists. It’s a bit like a mix between eye spy and pairs. I found about 30 pairs of tiny items such as buttons, pasta animals, beads, tiny pegs etc. And used some multicoloured dyed rice which we had previously used for sensory play. I got The Limpet to help me fill the bottle. I thought that it would be good for her to see all the items that were going into it and it also gives her a feeling of ownership over of it. The bottle is also proving very popular with The Gannet (aged 17 months). He seems to like turning it over and over seeing what he can find but he also just loves the noise it makes when he shakes it. I’ve been wanting to make these little guys for a while and have now finally got around to it. Aren’t they pretty?! I made some flower fairies a while back for The Limpet and she seemed to enjoy playing with them and still often does. So I decided to buy 6 more plain wooden figures (this time from Myriad). I painted the body of each one and used felt for their hats and cloaks. I thought about added a button to each one but then found some cute little rose beads in my craft stash. It was my first attempt at this sort of sewing but I’m pretty pleased with how they turned out, even the back is fairly neat. The Limpet has already been busy playing with them. I gave her some other rainbow items and she got to work creating a rainbow gnome land. Now that I’ve finally learnt to sew, I thought I should put my new skills to use. We bought The Limpet for her birthday some farm animals but she doesn’t have a farm house or barn or anything like that. So after searching through Pinterest, I decided to make a farm play mat. I’d like to say that I used lots of scraps of fabric that I had lying around but as I’m new to this sewing malarkey I don’t have many scraps. So off I went to my local haberdashery to buy lots of fabric in various textures, colours and patterns. I planned out a rough design and then got to work cutting bits up and sewing the whole thing together. I wanted to make it as appealing as possible so I added lots of different textures. I used mainly cotton fabric but also included a heavy wool, corduroy, felt, ribbon and wool. I wanted to inspire the monsters imagination and creativity so I didn’t make anything too obvious apart from the pond. It was only finished last night but so far it has gone down very well. 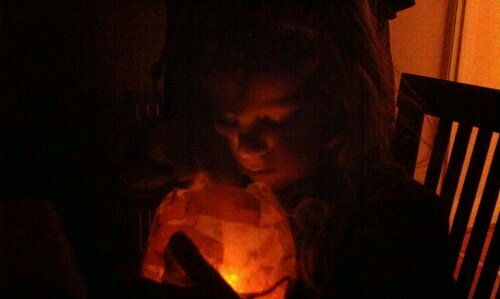 Here is a picture of The Limpet enjoying playing with it.